This is it, folks! My colleague, Thoshanka, doesn’t understand why I think it’s fabulous that Sri Lanka has a Ministry of Coconut Development. It’s the most natural thing in the world to her. And consider how abundant this natural resource is, here: it really does make sense. I think what tickles me is that it’s its own ministry – it doesn’t just fit in under something broader, like, say, Agriculture. This entry was posted on September 21, 2006 by somuchworldsolittletime. 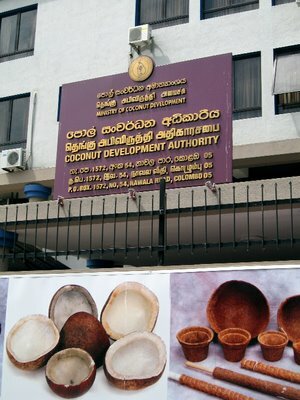 It was filed under Colombo, Sri Lanka and was tagged with Coconut Development.